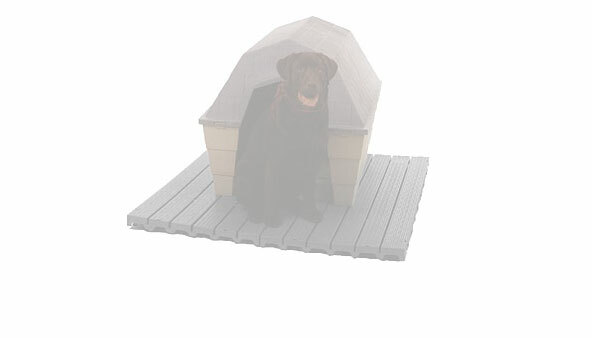 Kennel Deck is the perfect solution to providing a sanitary, yet comfortable surface for dogs in cages, runs, and more. Kennel Decks flooring system for Pets provides a clean and proper solution for all types of dogs or other animals in a kennel or dog cage. Molded from high-density plastic resins, its unique construction allows for easy drainage and air circulation while maintaining a flat, non-skid surface for comfort. Kennel Deck is the excellent choice for raising your dog above less-desirable floorings such as dirt, or concrete, which can contribute to disease or bone problems. Keeps dog high and dry. For 2 X 4 Foot Section, expandable. USE KENNEL DECKS FOR STORAGE!